These Phantom series gauges are designed for custom applications such as street rods, Pro Street, and anywhere you want a personalized look. 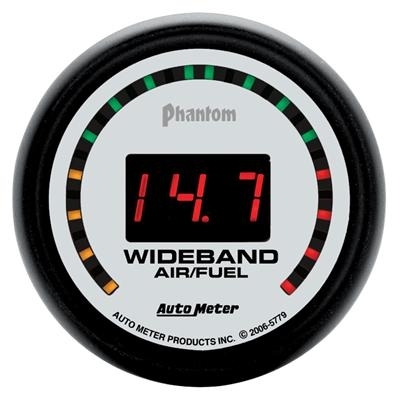 These gauges feature the same Auto Meter quality, but with their black trim rings and white faces, the Phantom series gauges offer you a distinct, alternative look. Street version Includes wide band oxygen sensor. This gauge displays both a bar graph and digital numbers. Air fuel ratio can be programmed for gasoline and alternate fuels (ethanol, methanol, propane, and CNG) from 6:1 to 20:1 depending on fuel type.